The port of Tien Sa, Da Nang, Vietnam. Most cruise ships dock here. The bus ride to Da Nang takes around 30 minutes. Taxis are available at the port entrance which is approximately 500 meters from the pier.The dock area is industrial. Plans are underway to change this, as the cruise market is growing fast. Some smaller ships dock at the Han River Port: Located on the western bank of the lower reaches of the Han River, much closer to Da Nang. Taxis are available at both locations. Prepare to negotiate. 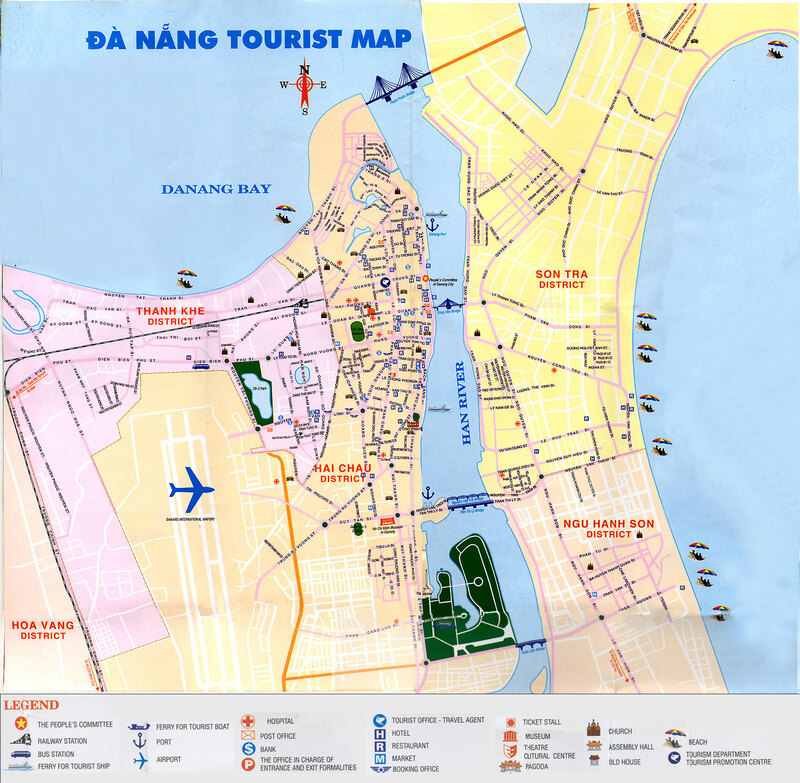 Da Nang is Vietnam's third largest city and the principal port in the central part of the country as well as the main port for neighboring Laos. It was originally known as Cho Han (the Market of the Han), later to be renamed Tourane by the French. Da Nang is on the threshold of becoming a major destination for tourists thanks to some unique attractions, spectacular scenery and the friendliness of the local population. Despite of its war-torn history, Da Nang is one of the most progressive cities in Vietnam, taking advantage of the new free-market principle. The town also has become one of the country's leaders in economic reform. Tourism and foreign investments have done much to boost the local economy. Among the city's highlights is the renowned Cham Museum, housing close to 300 Cham sculptures. Here history lovers get a glimpse into a very powerful era of Vietnam's past. Da Nang, however, may be most familiar to Americans who watched the movie Good Morning Vietnam and the popular television series China Beach. The latter immortalized a popular R&R G.I. resort of the Vietnam War. For the more than 20,000 Cao Dai in Vietnam, this temple is the sect's centerpiece. As in all Cao Dai temples, above the main altar is the image of the Giant Eye, which is the symbol of Cao Daism. Most interesting is a sign which says "Van Giao Nhat Ly," meaning that all religions have the same purpose. Built in 1923 by the French in pink sandstone with a single spire, the church serves Da Nang's Catholic community. The museum features a replica of Ho's house in Hanoi as well as a collection of various weaponry of the Vietnam War. A cab to Hoi An, see below, will run $16 to $25, and to Da Nang about $10 each way. Hoi An, 45 minutes away, once known as Faifo, was a major international port in the 16th and 17th centuries, and the foreign influences are discernible to this day. While the serious shipping business has long since moved to Da Nang, the heart of the city is still the Old Town, full of winding lanes and Chinese-styled shop houses, which is particularly atmospheric in the evening as the sun goes down. While almost all shops now cater to the tourist trade, the area has been largely preserved as is, which is unusual in Vietnam, and renovation has proceeded slowly and carefully - it's mercifully absent of towering concrete blocks and karaoke parlors. The Old Town of Hoi An is listed as a UNESCO World Heritage Site. Souvenir stalls set up on the pier sell a variety of items. Of particular interest are marble carvings. The Cho Con market in town is known for basketware and handicrafts. The national currency is the dong (đồng, VND), U.S. dollars are widely accepted, the standard exchange rate for small quantities being 16000 dong to US$1. By far the largest holiday of the year is Tết, also known as Vietnamese New Year, which takes place between late January and March following the lunisolar Chinese calendar. During the three days of Tet, shops close up and everybody heads home to their family, making this a somewhat difficult time to travel in Vietnam.